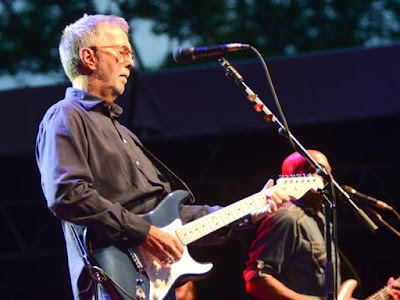 Eric Clapton delivered the first US performance in 40 years of the 1977 “Slowhand” track, “The Core”, during a headlining set at the 8th annual Greenwich Town Party in Greenwich, CT on May 26, and video from the event is streaming online. Clapton opened his 15-song set with "Somebody's Knockin'" from his most recent studio album, 2016’s “I Still Do,” before presenting a mix of solo hits, classic blues covers, Cream’s “White Room”, and a pair of tracks from his days with Derek And The Dominos. Clapton brought out Derek Trucks and Susan Tedeschi for the evening’s extended encore of the Robert Johnson blues standard, "Crossroads", with Tedeschi assisting on vocals. The guitarist will next play a pair of concerts in Germany this July ahead of a sold-out show at London’s Hyde Park, which will be followed by two dates at New York’s Madison Square Garden this fall. The Eric Clapton documentary, “Life In 12 Bars”, and its companion soundtrack will be released on June 8. Available on DVD and Blu-ray, the film by director Lili Fini Zanuck (Rush, Driving Miss Daisy) takes an unflinching and deeply personal look into the life of legendary 18-time Grammy winner while following his career through The Yardbirds, Cream, Blind Faith, Derek And The Dominos, and his solo years.